IDK | What Does IDK Mean? "IDK. I just work here." Person A: Why did you steal her coat? Person B: IDK. I just had the urge. IDK the plan for tomorrow. IDK is an initialism abbreviation. Technically, this means it is pronounced using its individual letters (i.e., Aye Dee Kay). 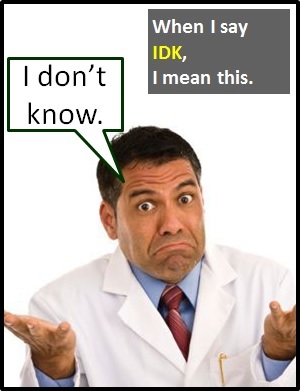 However, as this is harder to say than "I don't know," it is not uttered using its letters. In other words, the abbreviation IDK is for efficiency in writing and not efficiency in speech. Person A: How much will the hotel cost? Person B: IDK the reason.